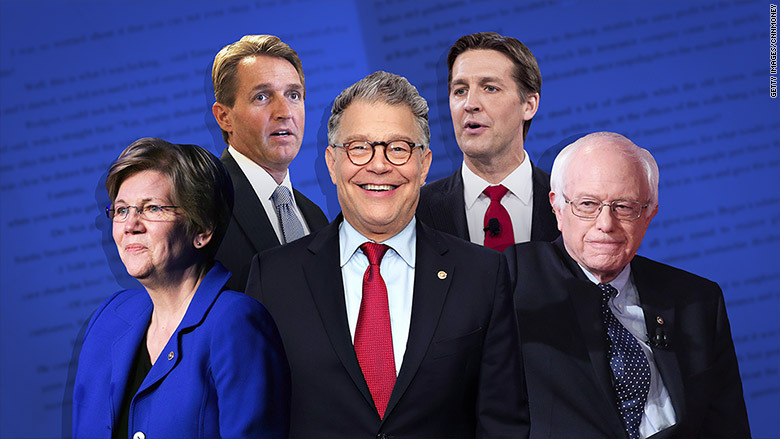 When the 2020 presidential race commences, Senators Al Franken, Elizabeth Warren and Cory Booker may find themselves locked in a battle for the Democratic' party's nomination. For now, however, the competition is limited to book sales, and the upper hand clearly belongs to Franken. "Al Franken, Giant of the Senate," Franken's cheeky memoir of his time in public office that came out at the end of May, has sold 167,046 copies, according to the market research company NPD. Warren's call to action, "This Fight Is Our Fight: The Battle to Save America's Middle Class," which hit shelves a month before Franken's, has sold 73,168 copies. But both of those titles dwarf the performance from Booker's 2016 book, "United: Thoughts on Finding Common Ground and Advancing the Common Good," which has sold only 13,607 copies. Nine senators (four Democrats, four Republicans and one independent) have released books since the beginning of last year, and most have seen only modest sales. Sen. Bernie Sanders tops the group with his post-election treatise. "Our Revolution: A Future to Believe In," released in November of last year, has sold 203,853 copies. The latest offering came courtesy of Arizona Republican Jeff Flake, whose book "Conscience of a Conservative: A Rejection of Destructive Politics and a Return to Principle" hit shelves on August 1. The book has made headlines for its pointed critiques of President Donald Trump, and the publicity has helped Flake already sell 7,388 copies. That figure already puts Flake within shouting distance of Senate Majority Leader Mitch McConnell, whose 2016 memoir, "The Long Game," has sold a little under 12,000 copies. "Written Out of History: The Forgotten Founders Who Fought Big Government," Sen. Mike Lee's conservative examination of the Constitution that was released in May, has sold 16,932 copies. While those GOP senators fall well short of the sales enjoyed by Franken, Warren and Sanders, Nebraska Republican Sen. Ben Sasse is at least in the ballpark. "The Vanishing American Adult: Our Coming-of-Age Crisis--and How to Rebuild a Culture of Self-Reliance," Sasse's 300-page lament on the state of the country's culture, which was released in mid-May, has sold 55,289 copies. Sanders and Franken boasted the highest first week sales, with 44,735 and 32,678 copies sold respectively. Franken, who made his living as a satirist before entering politics, is no stranger to literary success, boasting multiple New York Times best sellers before he entered the Senate.